Coming soon to a pet store in YOUR neighborhood! The LA City council is entertaining a ban on sales of pets in pet stores. The proposal was presented by a committee headed by City Councilmember and animal rights activist Paul Koretz. This follows on the heels of similar bans or proposed bans in other California cities, including Glendale, Irvine, Huntington Beach, Chula Vista, Laguna Beach, and West Hollywood. Never mind that the number of pet-selling stores in all these cities combined could be counted on one hand. No pet sales in pet stores, unless, of course, "rescue" groups are the ones selling them. And just who is initiating such proposals? Why, of course, it's these very same "rescue" groups. Best Friends Animal Society is leading the charge. How gullible can we be? Apparently, very. We seem blind to the fact that "rescue" groups import dogs into LA for the pet market….from commercial breeding establishments in other states, and from the streets overseas, and from foreign "puppy mills". Yet these groups, "Best Friends" and others, have the nerve to criticize retail pet stores? Best Friends Animal Society's "Pup My Ride" program plucks animals free of charge from commercial breeders in the Midwest and then trucks them into other states (including California), to sell at "adoption" events; and now, to sell in pet stores. Nothing quite as sweet as eliminating the competition, is there? Make no mistake about it, these groups are just as mercenary a group of pet purveyors as the Hunte Corporation or any so-called "puppy mill" out there. Pets purchased from regulated sources like pet stores come with legal protections for the buyer. These protections, provided under California's Lockyer-Polanco act, include monetary compensation when facing veterinary bills due to a pet's illness or infirmity. What sort of rules and regulations do "rescue" groups have regarding their sales? Slim to none. Just pay your money. What recourse will consumers have when they purchase a rescued pet with poor health or when their rescued animal bites their child? They will have NO recourse. The provisions of the Lockyer-Polanco act DO NOT apply to animals obtained from shelters or rescue. In 2004, the first case of canine rabies in over 30 years in Los Angeles happened when an infected dog was imported from Mexico. But hey, that's so much better than having dogs raised in the US under regulated conditions. Consumers should not be robbed of their right to choice in the marketplace. The foundation of our country is the free marketplace where competition is the most effective motivator for quality. The Los Angeles proposal does not limit the sales ban to puppies, but also includes a ban on the sales of cats and even rabbits. Yeah, I've heard about those horrible rabbit mills. A big problem. What's next, hamsters, turtles, or maybe even goldfish? Oops, sorry, San Francisco is already way ahead of us there. The proposal that Koretz presented to the city proposes to study the shelter stats for the next few years after the ban, to evaluate the effect of the ban. So, now the city is going to presume that there is a relationship between pet shop sales and shelter numbers? What sort of faulty logic is this? Wouldn't they first need to do a study regarding where the pets entering shelters and rescues originate? Because, there was a study done by a shelter in Nevada called "Heaven Can Wait." They discovered that fewer than 5% of shelter animals originated from pet stores, and only about 1-2% came from "professional breeders". So where is that presumed link between pet stores and shelter numbers? It's imaginary. Another one of those facts that "everybody knows" to be true. The committee also proposes to crack down on "illegal breeding operators." And what do "illegal breeding operators" have to do with pet store sales? Illegal breeders don't sell to pet shops. Does this crackdown relate to shelter numbers in any way? And how do we determine how (or even IF) pet stores, illegal breeders and shelters are interrelated? Of course, all these new rules and regulations will require enforcement from the police state. That is costly. No problem, Koretz and his committee state that the increased regulations will result in...ready for this one?....more license revenues! And how the devil do they think that they will increase revenues from dog licensing when they are prohibiting sales? So they plan to enforce their new rules with money that they won't be getting. Makes perfect sense to me. Well, politicians are rarely known for their skills of logic; or, for that matter, for their intelligence. Seen the movie "Idiocracy"?. Heck, we are already there. And our new president? 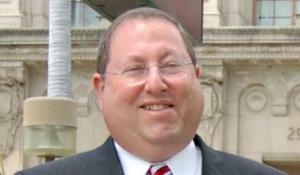 The most likely candidate is the animal rights lackey LA City Councilman who brings us such great ideas, Paul Koretz. Betcha the portly Koretz's next proposal will be to force us all to make our pets drink Brawndo instead of water.